I’ve noticed that many soap makers, including myself, also enjoy cooking and baking. I will confess though that these days I think more about soap than I do about food. More than 3 years ago, I got hooked on making bread. It all started when I stumbled upon this NY Times recipe, which, at that time, I found revolutionary. After I made my first loaf, a new passion was born. I became really serious about it and even made my own starter from scratch, and went on to making bread the traditional way. For more than a year, I baked bread almost everyday, but I eventually stopped because my family and I felt we were eating way too much carbs. Ever since Natalia casually mentioned here about her new obsession for homemade bread, I started to miss it. I finally got around to making it again when my French friend stayed with us last month. She loved it and had it for breakfast everyday. Even though she’s not really into baking, it looks like this no-knead technique is going to change all that. Most of you are probably proficient bakers already, but for those who are daunted by the idea of making bread, or who are very busy, or simply lazy, I encourage you to try this. It won’t take much of your time, and I guarantee you’ll be so pleased with yourself and grinning from ear to ear after you see this artisan-looking bread coming out of your oven. I’ve made many variations but my favourites are the ones with muesli and chia seeds. One day I will learn how to take videos, but for now, I’m only limited to pictures. 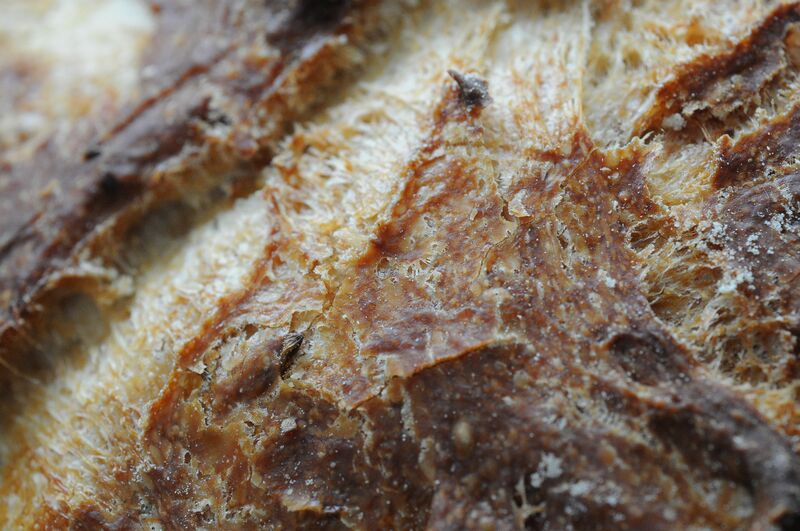 Luckily, there are plenty of Youtube videos on how to make no-knead bread. Click here to see the one by cookbook author and NY Times journalist, Mark Bittman. I’ve tweaked the original recipe and I’ve also increased it by 50%. One loaf is good for 4 to 5 persons. 1. In a large bowl or container (allow space for the dough to triple in size), pour in the water and dissolve the salt in it. 3. 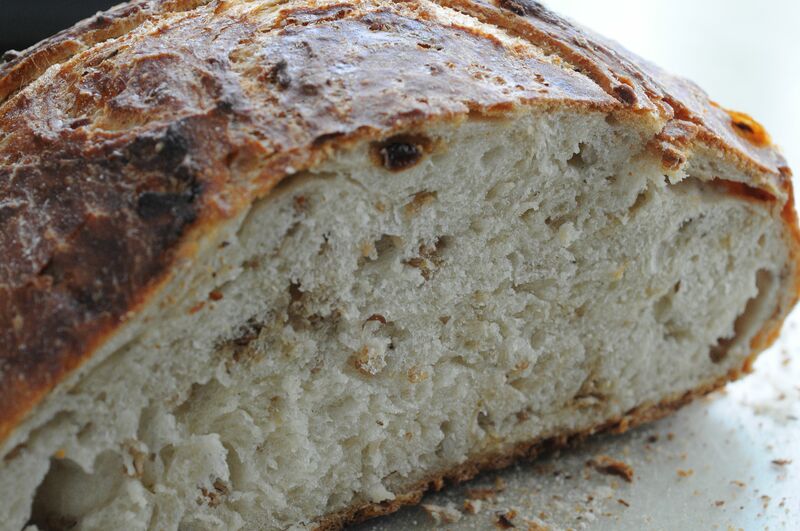 If you’re making plain bread, skip this and go to the next step. If you’re adding muesli or chia seeds, add it now into the water mixture, including the additional water. Stir and let it sit for about 5 minutes to allow it to absorb water. 4. Add the bread flour into the water mixture and mix with a wooden spoon or silicone spatula just until there’s no more trace of dry flour. If you wish, you can finish mixing with your hand. 5. Cover the bowl or container. Let it sit at room temperature for 12-18 hours, but I usually just let it sit for 8-12 hours. 6. When the dough is ready (it would have tripled in volume and have big holes), place a large cast iron dutch oven with its lid on in the oven (If the knob is not metal, wrap it with aluminum foil). Crank up your oven to its highest setting, usually 500˚F or 250˚C. 7. While the oven is pre-heating, place a sheet of baking paper on one side of the table. Sprinkle flour over it. 8. Oil your hands and work surface with olive oil. Dump the dough on the oiled surface. Stretch 2 opposite sides of the dough and fold in towards the center. Turn the dough 45˚ and do the same for the other ends. Turn over the dough and transfer to the floured paper. Cover with a large inverted bowl. 9. When the oven has reached the right temperature, carefully remove the hot dutch oven. Remove the lid. Holding on to the paper, transfer the dough into the dutch oven. Cover and return to the oven. 10. Bake for 30 minutes with the lid on. Remove the lid, lower the temperature to 200˚C or 400˚F, and continue to bake for another 15-20 minutes or until the crust is golden brown. For better understanding, the water is 75% of the flour weight, and salt at 2%. I find that the higher water percentage of the original recipe is a bit too gummy for my taste. When adding muesli/oats or chia seeds, extra water is needed to compensate for their absorbent nature. If you don’t own a cast iron pot, no worries! Place the dough on a regular baking sheet and liberally spray the surface of the dough with water before it goes into the oven. After 10-15 minutes, making sure you are wearing oven mitts because the steam can burn, spray the dough again in the oven. The water will help keep the crust thin and crisp. 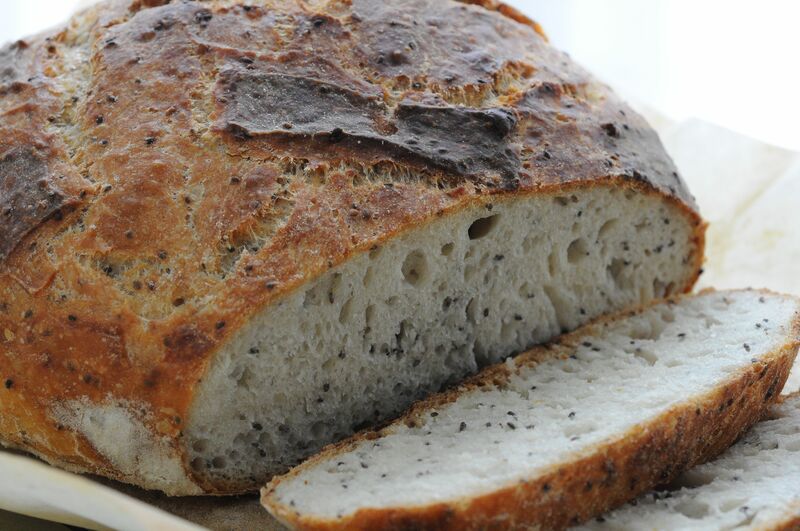 Warning: making no-knead bread can start a new addiction! 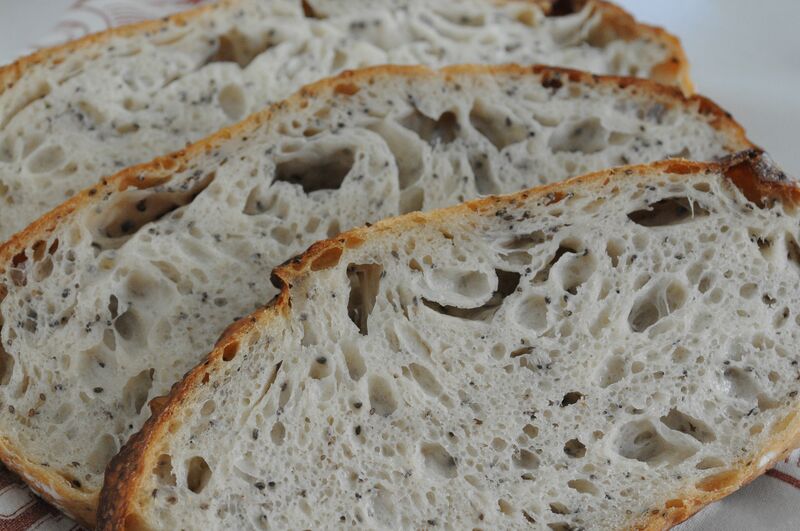 This entry was posted in Food, Recipe and tagged chia seed bread, muesli bread, no-knead bread on February 2, 2014 by soapjam. 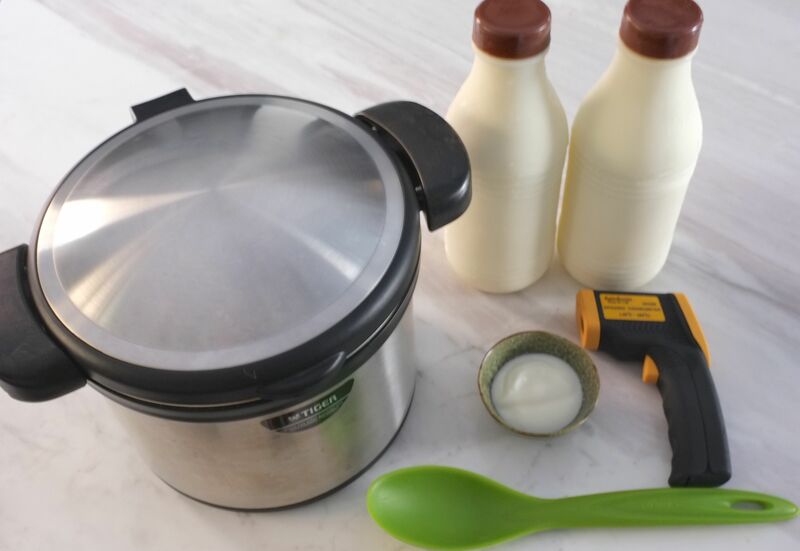 This is a long overdue tutorial that I promised when I wrote Yogurt Soaps and Notes, but then it hit me that my method involves using a special equipment that most people don’t have. 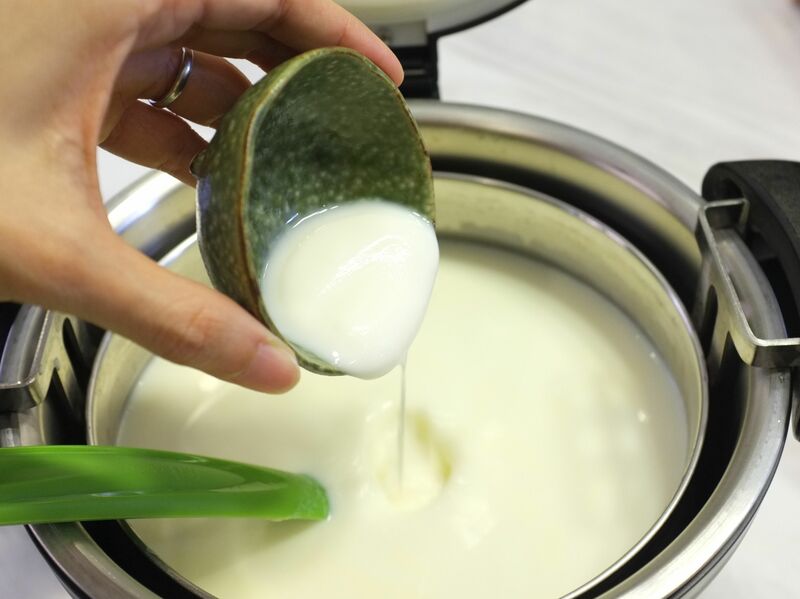 I was hesitating whether to write this post or not, but I hate breaking promises, and I honestly think it is one of the best and most reliable methods, especially if you make a lot of yogurt regularly. Google How to Make Yogurt and you will find numerous ways to improvise if you don’t have a yogurt maker. I have been there and done that with most methods, but results were not always very consistent, until my mom discovered the Magic Cooker. She used it for soups and stews, but I had other ideas for it. The key to making yogurt is maintaining an ideal temperature of 110˚-120˚F (43˚- 49˚C) for the bacteria to grow, multiply, and do their thing. This, the Magic Cooker does perfectly. A Magic Cooker works like a slow cooker except that there is no electricity involved. 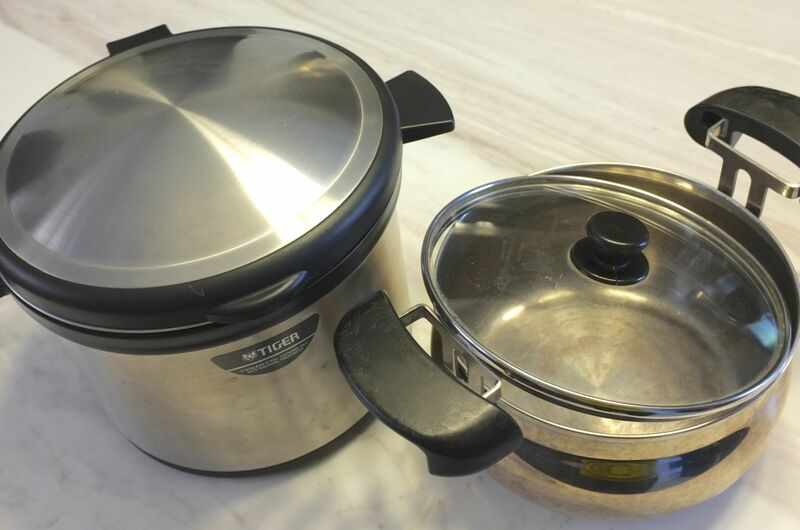 It consists of an inner pot which you use to cook food in, and an outer pot which holds the inner pot to continue the cooking using the stored energy. Outer and inner pots of the Magic Cooker. The inner pot nestled in the outer pot. I think my mom got hers from a friend of a friend, but I checked Amazon just for reference and found that they have the bigger unit. The unit I use at home is an older model, and I think the capacity is 3 liters, although I use it for only 2 liters of milk at a time. I am in no way paid to endorse the product, but here’s the link for those who are curious. It is kinda pricey, but since you can use it for so many things without the use of added electricity, I think it is worth the investment in the long run. Pictured below are the things you will need to prepare. For this recipe, I used 2 liters of raw milk. For every liter of milk, you will need about a tablespoon of yogurt for proper inoculation. You can use store-bought plain yogurt as your “mother” yogurt, and for succeeding batches, you just need to reserve a little bit of what you made. 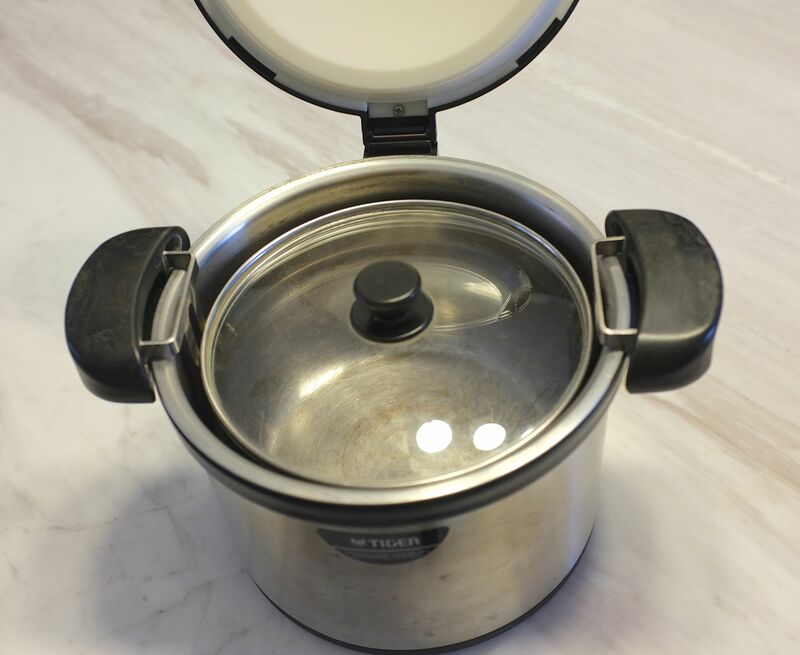 By the way, the fuller you fill the Magic Cooker, the better it holds the temperature. At the very least, make it half full. If you are using raw milk, you have to pasteurize or heat it up to a minimum temperature of 185˚F (85˚C), otherwise it won’t work. It’s ok if your milk ends up hotter, like it did with me. Next, place the pot of milk in a basin/bowl/sink with cold water to cool it down to 120˚F. Stir it from time to time to prevent skin from forming. 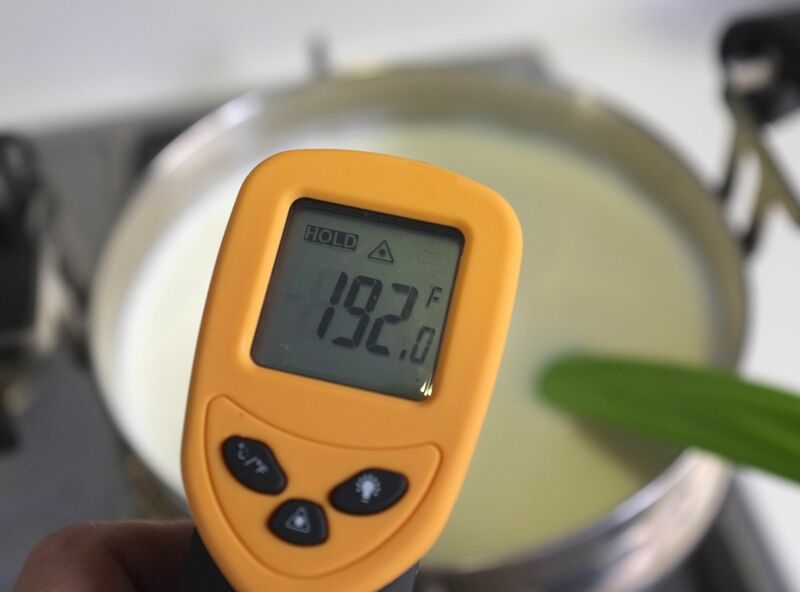 If you are using pasteurized or UHT milk, which I sometimes do, you just need to heat up the milk to 110˚-120˚F, and skip the whole cooling process, unless you accidentally overheated the milk. If you don’t have a thermometer, you can use your finger (clean!) to gauge the temperature of the milk. When you put your finger in, it should feel very warm and you should be able to leave your finger in the milk up to the count of ten without feeling like you are getting scalded. When your milk is at the ideal temperature range of 110˚-120˚F (I personally prefer to have my milk at the higher end of the range), add the mother yogurt and stir thoroughly. Cover the inner pot with its glass lid and place it inside the outer pot. Close the lid of the outer pot and leave it undisturbed for 4-5 hours. After the incubation period, check to see if the milk has thickened up by shaking it a bit. If it jiggles like jello, it is ready. 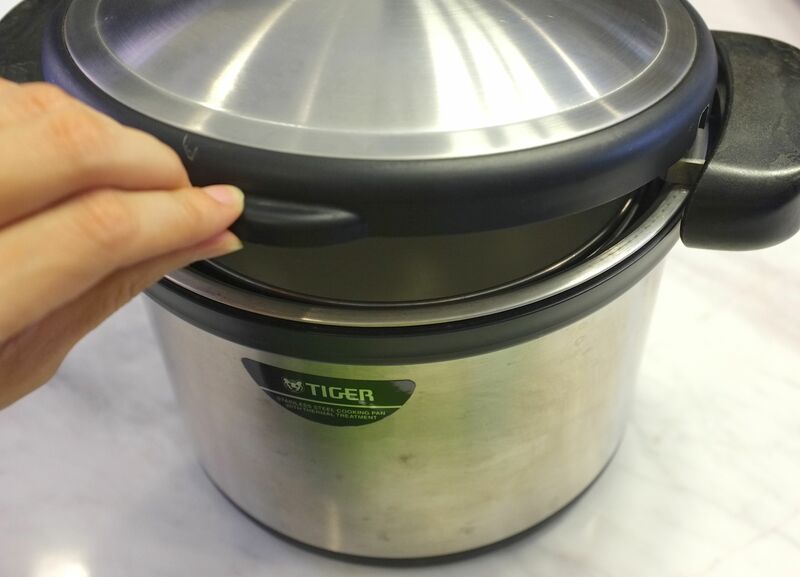 If it still looks runny, give it another couple of hours before transferring the inner pot to the refrigerator. Texture of chilled yogurt is like silken tofu. Since I used raw milk, you can see that the fat has separated and formed a soft yellow layer. Yum! The whey separates naturally. You can mix everything with a wire whisk or scoop out the whey for a thicker yogurt. 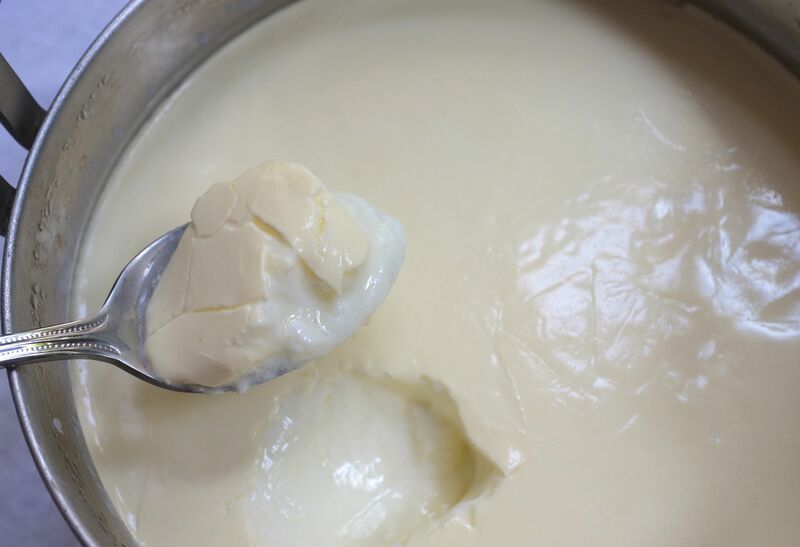 To make yogurt cheese, place in a cheesecloth and allow the whey to drain. I once forgot about the yogurt until after 12 hours. I was expecting it to be spoiled already, but surprisingly, it was still fine and not even that sour! I find that raw milk produces a thicker and richer yogurt, although technically, it’s no longer raw. With pasteurized milk, some people add powdered milk to make a thicker yogurt, or you could also use milk fortified with calcium. 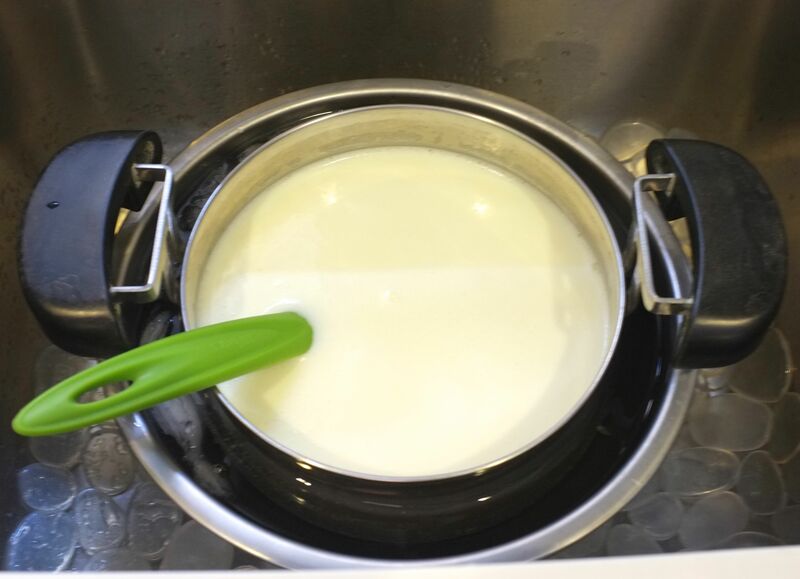 This entry was posted in Food, Recipe and tagged Magic Cooker, Raw Milk, Yogurt on November 6, 2013 by soapjam.